A world renowned center for dance and creative expression, Earthdance provides an ideal setting for workshops, conferences, special events, group and personal retreats. This Studio, built in 1999, is an architectural marvel. Gazing up from the center of this astounding 2,000-square-foot space, you look through a circle of performance lights at a huge pillar suspended from the 45-foot-high peak. On your back, you feel the silky sprung maple floor, warmed by heat radiating from beneath the wood. Looking to the side, through the circle of windows, you glimpse an apple orchard, an old foundation, and a meadow of soft grasses. The cathedral-roofed dance barn is a large (24' x 48') studio equipped with piano, sound system, and limited theatrical lighting. The dance barn is bright and spacious with a sprung maple floor and a wall of windows looking out into the woods. A third smaller space located on the second floor of the farmhouse. Our 1812 farmhouse has been thoroughly renovated in the last decade, offering a beautiful spacious home. As you enter the main house through a doorway adorned with hand-crafted stained glass windows you'll find our welcome center and large coat room. Strolling through our living room, dining area and sun porch, you will find comfortable, well-lit spaces to make your own during your visit. Our homey atmosphere is enhanced by hand made decorations created by our resident staff, works of art commissioned from or donated by local artists, a collection of books and videos for guest use, floor cushions and blankets for lounging, and numerous other personal touches. The facilities include two full bathrooms, two half baths, and a shower room. The kitchen and dining area is the heart of the Earthdance home. Located at the intersection between the living spaces and the dance spaces, the kitchen and dining area pulse with energy and life as members of the ever-evolving Earthdance community meet, gather and share food. The dining area includes a long, maple table that seats 16, and smaller tables in our beautiful sunporch enclosed with wall to wall windows overlooking the vegetable and flower gardens. 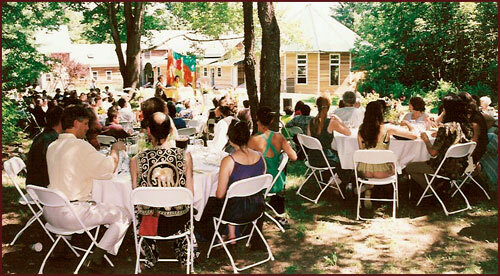 The Gratitude Lodge is a short 2 minute walk from our studios and main facility. 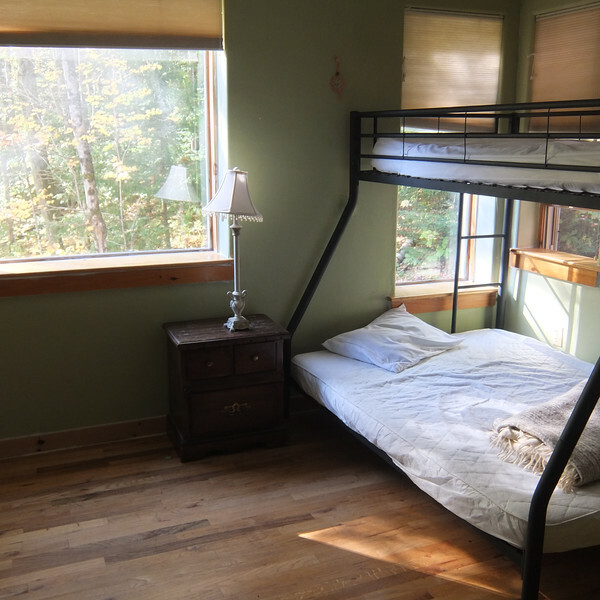 The dormitory offers 3 floors of housing with an assortment of larger and smaller rooms. During the summer, we also offer a number of beautiful tent cabins as options for our guests. To see more about our tent cabins, click here. 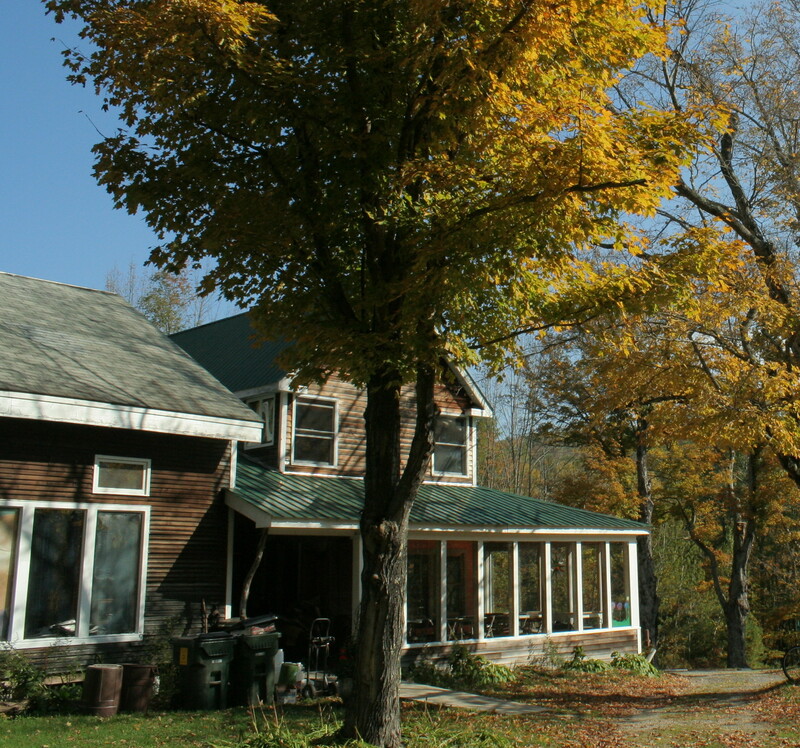 Across the meadow from Earthdance is Nine Mountain, a beautiful, spacious post & beam B&B. Operated today by Kelly Bitov, Hilary Lake, and Brahim Ainabi, Nine Mountain is often available to our guests who prefer a Bed & Breakfast setting. The hot tub at their facility is also often accessible to Earthdance guests. There are other Bed & Breakfasts available in the local area. Contact Earthdance directly for more information. We would like to acknowledge that Earthdance is situated on the traditional territory of the Mohican ~ People of the Waters that are never Still ~. Specifically, the Stockbridge-Munsee Band, who were removed Westward and many of whom now live on a reservation in Wisconsin. It is important that we recognize our place within the ongoing process of colonialism and also that we appreciate this sacred land, spaces, and energies present here. Find out more about the history of the Stockbridge-Munsee Band here. Earthdance sits on 125 acres of wooded land that extend seamlessly into a great expanse of forest that includes an Audubon wildlife protected area and Deer Hill (whose summit is a pleasant one hour hike from Earthdance). Winding trails that follow the whispering sounds of trickling water make for delightful adventures into the forest. In the winter the snowfalls are immaculately pristine, providing ideal conditions for snow-shoeing, cross-country skiing and sledding. In the summer, the woods teem with wildlife and wild flowers, providing a vivid and serene natural environment for camping, hiking and observing nature. Outside the buildings at Earthdance, you will find flower beds, vegetable gardens, meadows, woodland paths and giant old maple trees. Click here to view a campus map or trail map.